Microsoft Microsoft Model 1627. Having Issues?. Special for device Microsoft Surface Pro 3 / Pro 4 Tablet. Output(DC): 12V 2580mA. Input(AC):100v-240v 0.3A 50/60Hz. Small and light weight design is convenient for everyone to carry. Weight:252g. Input: AC100-240V (worldwide use) Output: 12V 2.58A - 36W. 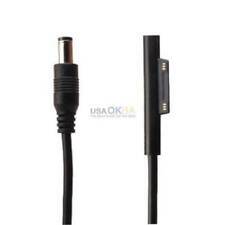 Item includes AC Adapter and 2 prong US Power Cord - Total Length: 9-Foot. Warranty & Support. WE ARE NOT ABLE TO STOP AN ORDER ONCE IT'S PLACED! Replacement Power Adapter Charger for Microsoft Windows 12 inch Surface Pro 4 Core M3 Tablet, Adapter Model 1735. Please Note: This adapter Not compatible for surface pro 4 i5 i7 tablet. 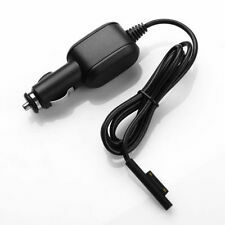 Output: 15V 1.6A; Input: AC100-240V (Worldwide use); USA standard plug version. Automatic thermal, overload cut-off, and short circuit protection. Specification: Condition: Brand New Input: AC 100-240V, 50-60Hz Manufactured with the highest quality materials Built-in overload, over-voltage and short circuit protection High quality UL SA CE RoHS approved 100% compatibility with the original This product is good for the following Models and Part# New 12V 3.6A AC Power Adapter Charger for Microsoft Surface Pro 2 1536 Tablet 100% New Components - never refurbished, recycles, or used Non-OEM but 100% Compatible - Guaranteed to meet the specifications of your original device Nearly all our products have UL, CE and RoHS certificates. 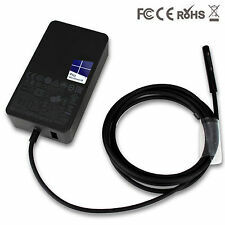 Input: AC 100-220V,50-60Hz Output: 15V 2.58A and 5V 1A (USB) Power: 44Watt Connector size: Microsoft special connector(reference the picture) Warranty: 12 months Conditon: 100% new and OEM.It's in bulk package,It will come with power cable. 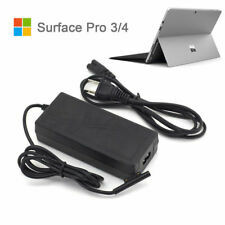 Compatible Model Microsoft Surface Pro 5 Package Include 1X AC Adapter 1X power cable(power cord),. Microsoft surface Pro 3. - Output: DC 12V-2.58A. - Over temperature protection, over-load and short circuit protection. - Power: 36W Max. - Small and light weight design is convenient for everyone to carry. Model : 1706. Output(DC): 15V 4A. Special for device Microsoft Microsoft Surface Book & Surface Pro 3, Pro4(Core i5 i7,not M). 1x AC Power Adapter. Small and light weight design is convenient for everyone to carry. Compatible with surface 3, pro 3, pro 4, pro 5, pro 6 and surface books! Input(AC):100v-240v 1A 50/60HzOutput(DC): 12V 2.58A 36W. 1x adapter. Pls note this will not fit for Pro 4 ( i3 ). Such as battery, ac adapter etc. Laptop battery for hp. Laptop battery for dell. Laptop battery for apple. Special for device Microsoft Microsoft Surface Book, Book 2 & Surface Pro 5, Pro 3, Pro4(Core i5 i7,not M) ,Surface Go. Output(DC): 15V 4A. 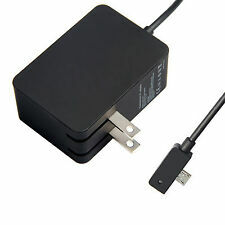 1x AC Power Adapter. Such as battery, ac adapter etc. Small and light weight design is portable for everyone to carry. Compatible for Microsoft Windows Surface Pro 3. Output: 12V 2.58A. Circuit Protection : Short Circuit Protection and Overload Protection. Input: 100-240V 50/60HZ. Usage for laptop. Output power: 1-36W. Output current: 2.58A. Output frequency: 50-60HZ. When encountering with force majeure, the processing of orders will be delayed. Nevertheless, it is ensured that your order will be processed in a fast manner when weather permits. Made for Microsoft Surface Book & Surface Pro 3, Pro4. Output(DC): 12V 2.58A (with one USB port: 5V=1A). 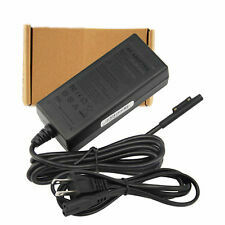 1x AC Power Adapter. Input(AC):100v-240v 50/60Hz. Small and light weight design is portable for everyone to carry. Compatible for Microsoft Windows Surface Pro 3. Output: 12V 2.58A. We will do our best to resolve your issue. We will respond and resolve your issue for you ASAP. Input: 100-240V 50/60HZ. Model : 1706. Output(DC): 15V 4A. Special for device Microsoft Microsoft Surface Book & Surface Pro 3, Pro4(Core i5 i7,not M). 1x AC Power Adapter. Input(AC):100v-240v 50/60Hz. Small and light weight design is convenient for everyone to carry. This is a used item in good condition. Specification: Condition: Brand New Input: AC 100-240V, 50-60Hz Output: 12V 2.58A Manufactured with the highest quality materials Built-in overload, over-voltage and short circuit protection High quality UL SA CE RoHS approved 100% compatibility with the original This product is good for the following Models and Part# For Microsoft Surface Pro 4 3 Tablet Power Supply 1625 Adapter 12V 2.58A Charger 100% New Components - never refurbished, recycles, or used Non-OEM but 100% Compatible - Guaranteed to meet the specifications of your original device Nearly all our products have UL, CE and RoHS certificates. Microsoft surface Pro 3. - Power: 36W Max. - Small and light weight design is convenient for everyone to carry. Compatible Models - Color: Black. 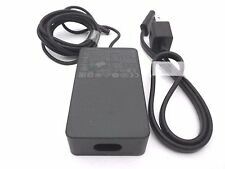 Power Supply for Microsoft Surface Pro 3 Pro 4 - AC Charger Cord Adapter 12V US. Condition is New. Shipped with USPS First Class Package. This adapter is in good used working condition. You will receive everything shown in photos (excluding display pieces) unless otherwise noted. Input: AC100-240V, 50/60Hz (worldwide use); Output: 5.2V 2.5A 13W. Such as battery, ac adapter etc. We will very appreciated for your doing. We work with a good quality OEM supplier and factory. Help you and us save money greatly. 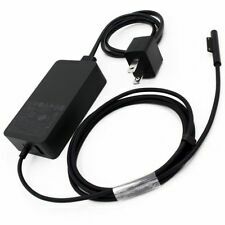 Features: AC Wall charger adapter for Microsoft Surface pro 3 tablet Circuit Protection : Short Circuit Protection and Overload Protection Performance : High Stability and Efficiency Specifications: Color: Black Input: 100-240V 50/60HZ Output: 12V 2.58A Plug: US plug Fitment: Pro 3 Pro 4 ( i5 i7 ) Package Includes: * 1x AC Wall Charger Adapter for Microsoft Surfacse Pro 3/Pro 4 Tablet. Output: 12V 2.58A. Cable & Converter. AC Adapter. Model : 1706. Output(DC):15V 4A. Special for device Microsoft Microsoft Surface Book & Surface Pro 3, Pro4(Core i5 i7,not M). 1x AC Power Adapter. Laptop battery for hp. Laptop battery for dell. Microsoft Surface. Output: DC 12V 2.58A. Input: AC 100-240V, 50-60Hz. Pls note this will not fit for Pro 4 ( i3 ) ! •Pro 4 ( i5 i7 ). We will work on resolving your particular case ASAP. Duty Rate is vary subject to different countries' regulation. Specification: Condition: Brand New Input: AC 100-240V, 50-60Hz Output: 15V 4A 60W Manufactured with the highest quality materials Built-in overload, over-voltage and short circuit protection High quality UL SA CE RoHS approved 100% compatibility with the original This product is good for the following Models and Part# 65W AC Adapter Power Supply 1706 15V Microsoft Surface Book/ Pro 4 Q4Q-00001 100% New Components - never refurbished, recycles, or used Non-OEM but 100% Compatible - Guaranteed to meet the specifications of your original device Nearly all our products have UL, CE and RoHS certificates. Specification: Condition: Brand New Input: AC 100-240V, 50-60Hz Output: 15V 4A 60W Manufactured with the highest quality materials Built-in overload, over-voltage and short circuit protection High quality UL SA CE RoHS approved 100% compatibility with the original This product is good for the following Models and Part# 65W Adapter DYNR01 G3HTA027H for Microsoft Surface PRO 4 1724 12.3" Tablet 100% New Components - never refurbished, recycles, or used Non-OEM but 100% Compatible - Guaranteed to meet the specifications of your original device Nearly all our products have UL, CE and RoHS certificates. Output: DC 12V 2.58A. We always make an effort to keep it upto date. Connecter Size: Refer to the pictures. Connector: Magnetic 12PIN. - Power: 36W Max. Microsoft surface Pro 3. - Small and light weight design is convenient for everyone to carry. - IC Chip recognizes a full battery & automatically switches to saver mode. Output: DC 15V 6.33A. SCP: Short Circuit output Protection. Input: AC 100V-240V, 50-60Hz. OCP: Over Current output Protection. For New Surface Pro, Surface Pro 5, 2017, m3-7Y30 / i5-7300U / i7-7660U.